This is a web version of a review of Peter Gotzsche’s book. It appeared in the April 2014 Healthwatch Newsletter. Read the whole newsletter. It has lots of good stuff. Their newsletters are here. Healthwatch has been exposing quackery since 1989. Their very first newsletter is still relevant. Most new drugs and vaccines are developed by the pharmaceutical industry. The industry has produced huge benefits for mankind. But since the Thatcherite era it has come to be dominated by marketing people who appear to lack any conscience. That’s what gave rise to the Alltrials movement. It was founded in January 2013 with the aim of ensuring that all past and present clinical trials are registered before they start and that and their results are published The industry has been dragged, kicking and screaming, towards a new era of transparency, with two of the worst offenders, GSK and Roche, now promising to release all data. Let’s hope this is the beginning of real open science. This version is not quite identical with the published version in which several changes were enforced by Healthwatch’s legal adviser. They weren’t very big changes, but here is the original. As someone who has spent a lifetime teaching pharmacology, this book is a bitter pill to swallow. It makes Goldacre’s Bad Pharma seem quite mild. In fairness, the bits of pharmacology that I’ve taught concern mostly drugs that do work quite well. Things like neuromuscular blocking agents, local anaesthetics, general anaesthetics, anticoagulants, cardiac glycosides and thyroid drugs all do pretty much what is says on the label. Peter Gøtzsche is nothing if not evidence man. He directs the Nordic Cochrane group, and he talks straight. His book is about drugs that don’t work as advertised. There is no doubt whatsoever that the pharmaceutical industry has behaved very badly indeed in the last couple of decades. You don’t have to take my word for it, nor Peter Gotzche’s, nor Ben Goldacre’s. They have told us about it themselves. Not voluntarily of course, but in internal emails that have been revealed during court proceedings, and from whistleblowers. The pharmaceutical industry is the biggest defrauder of the US federal government under the False Claims Act. 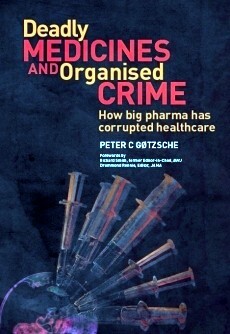 Roche led a cartel that, according to the US Justice Department’s antitrust division, was the most pervasive and harmful criminal antitrust conspiracy ever uncovered. Multibillion dollar fines have been levied on all of the big companies (almost all in the USA, other countries have been supine), though the company’s profits are so huge they are regarded as marketing expenses. It’s estimated that adverse effects of drugs kill more people than anything but cancer and heart disease, roughly half as many as cigarettes. This horrifying statistic is announced at the beginning of the book, though you have to wait until Chapter 21 to find the data. I’d have liked to see a more critical discussion of the problems of causality in deciding why someone died, which are just as big as those in deciding why somebody recovered. Nevertheless, nobody seems to deny that the numbers who are killed by their treatments are alarmingly high. But the worst single area is psychiatry. Two of the chapters in the book deal with psychiatry. Nobody has the slightest idea how the brain works (don’t believe the neuroscience hype) or what causes depression or psychosis. Treatments are no more than guesses and none of them seems to work very well. This referred to the now-notorious study 329. It was intended to show that paroxetine should be recommended for adolescent depression. The paper that eventually appeared in 2001 grossly misrepresented the results. 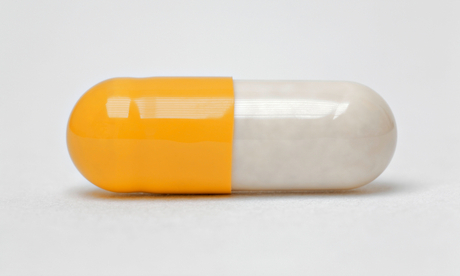 The conclusions stated “Paroxetine is generally well tolerated and effective for major depression in adolescents”, despite the fact that GSK already knew this wasn’t true. The first author of this paper was Martin Keller, chair of psychiatry at Brown University, RI, with 21 others. But the paper wasn’t written by them, but by ghost authors working for GSK. Keller admitted that he hadn’t checked the results properly. That’s not all. Gøtzsche comments thus. The extent of corruption at Brown University rivals the mob. The infamous case of Richard Eastell at Sheffield university is no better. He admitted in print to lying about who’d seen the data. The university did nothing but fire the whistleblower. Another trial, study 377, also showed that paroxetine didn’t work. GSK suppressed it. Where were the regulatory agencies during all this? The MHRA did ban use of paroxetine in adolescents in 2003, but their full investigation didn’t report until 2008. It came to much the same conclusions as the TV programme six years earlier about the deceit. But despite that, no prosecution was brought. GSK got away with a deferential rap on the knuckles. Now we can add bloggers to that list of people who ask difficult questions. The scam operated by the University of Wales, in ‘validating’ external degrees was revealed by my blog and by BBC TV Wales. The Quality Assurance Agency came in only at the last moment. Regulators regularly fail to regulate. Despite all this, the current MHRA learning module on SSRIs contains little hint that SSRIs simply don’t work for mild or moderate depression. Neither does the current NICE guidance. Some psychiatrists still think they do work, despite there being so many negative trials. The psychiatrists’ narrative goes like this. You don’t expect to see improvements for many weeks (despite the fact that serotonin uptake is stopped immediately). You may get worse before you get better. And if the first sort of pill doesn’t work, try another one. 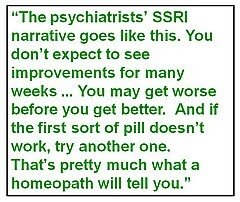 That’s pretty much identical with what a homeopath will tell you. The odds are that its meaning is, wait a while and you’ll get better eventually, regardless of treatment. It’s common to be told that they must work because when you stop taking them, you get worse. But, perhaps more likely, when you stop taking them you get withdrawal symptoms, because the treatment itself caused a chemical imbalance. Gøtzsche makes a strong case that most psychiatric drugs do more harm than good, if taken for any length of time. Marcia Angell makes a similar case in The Illusions of Psychiatry. Gøtzsche will inevitably be accused of exaggerating. Chapter 14 ends thus. “Merck stated only 6 months before it withdrew Vioxx that ‘MSD is fully committed to the highest standards of scientific integrity, ethics, and protection of patient’s wellbeing in our research. We have a tradition of partnership with leaders in the academic research community. Great. Let’s have some more of such ethical partnerships. They often kill our patients while everyone else prospers. Perhaps Hells Angels should consider something similar in their PR: We are fully committed to the highest standards of integrity, ethics and protection of citizens’ well- being when we push narcotic drugs. We have a tradition of partnership with leaders in the police force”. But the evidence is there. The book has over 900 references. Much of the wrongdoing has been laid bare by legal actions. I grieve for the state of my subject. The wrongdoing by pharma is a disgrace. The corruption of universities and academics is even worse, because they are meant to be our defence against commercial corruption. At a recent meeting I said that it was tragic that medicine, the caring profession, was also the most corrupt (though I’m happy to admit that other jobs might be as bad if offered as much money). At present there is little transparency. There is no way that I can tell whether my doctor is taking money from pharma, data are still hidden from public scrutiny by regulatory agencies (which are stuffed with people who take pharma money) as well as by companies. Governments regard business as more important than patients. In the UK, the Government continued promotion of the fake bomb detector for many years after they’d been told it was fake. Their attitude to fake medicines is not much different. Business is business, right? One side effect of the horrific corruption is that it’s used as a stick by the alternative medicine industry. That’s silly of them, because their business is more or less 100% mendacious marketing of ineffective treatments. At least half of pharma products really do work. Fines are useless. Nothing will change until a few CEOs, a few professors and a few vice-chancellors spend time in jail for corruption. Read this book. Get angry. Do something.